Amy McHodges - A Salute to All Thoughts, But Mostly Mine: The Muppets are Coming! Pirates, Schmirates. The movie I am incredibly curious about right now? The Muppets. The last Muppet theater release was eleven years ago!! 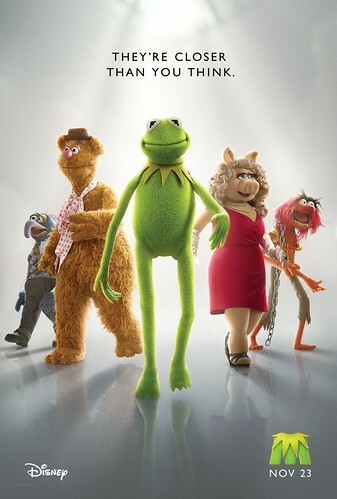 The new movie stars the Muppets, Jason Segal, Amy Adams and Chris Cooper. Segal not only stars in the movie but he cowrote it and is an executive producer. I love Jason Segal's work so I am interested to see what he does with the Muppets. The movie opens November 23rd, the day before Thanksgiving. To keep up with the Muppets you can go to their Disney website, their Facebook page, or you can follow Muppets Studio on Twitter. Since I have to wait until November for the Muppets, I am going to see Pirates of the Caribbean On Stranger Tides this weekend! I had to literally squeal seeing that picture! LOVE IT!